This event is licensed and sanctioned by the Illinois State Athletic Board, a division of the Department of Financial & Professional Regulation. NOVEMBER 8 AT THE UIC PAVILION IN CHICAGO!! PROFESSIONAL MIXED MARTIAL ARTS RETURNS TO CHICAGO! 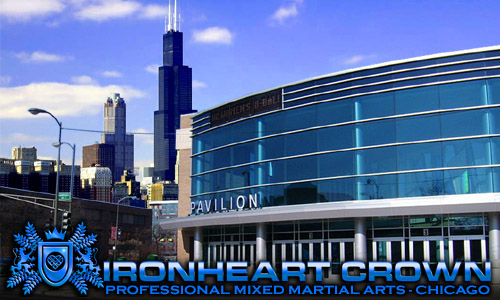 Don't miss the long-awaited return of Chicago's oldest and most respected venue for world-class, professional mixed martial arts competition, the IRONHEART CROWN! After thriving across the border in Hammond, Indiana for seven years, the Ironheart Crown is back, bigger and better than ever before! The card is currently in the making with a new promotional team working hard to ensure that the upcoming show lives up to the Ironheart Crown's rich tradition of excellence. Stay tuned for details as they unfold. The official website will be updated frequently with breaking information. Subscribe to the Ironheart Crown VIP mailing list for future updates and announcements. All subscription members will be eligible to receive early purchase discounts on tickets, with first crack at VIP seating. Subscription members will also be entered in a drawing for valuable prizes to be awarded at the November show. CHICAGO, IL - While not yet signed and sealed, Ironheart Crown promoter, Eric Moon recently met with Andrew Kloster of the American Fight League (AFL) to discuss an affiliation between the organiztions. The AFL is a unique new start up league out of Kentucky. In addition to promoting shows of their own, the group is looking to reach out to other promotions across the nation to become a unified league with regional rankings and legitimate, merit-based titles. The Ironheart Crown has been sanctioned by the International Shooto Commission for six years, and the event has established itself as the highest stage for Professional Shooto competition in North America. This status has added additional prestige to the already well-respected Ironheart show. However, with its return to Chicago, the Ironheart Crown will make a transition from hosting fights in a boxing ring to using a cage, a movement which is fast becoming the industry standard. Shooto rules forbid the use of a cage and require that all matches be held in ring. While the Ironheart Crown will retain its Shooto affiliation and will continue to host occasional shows using a boxing ring, events which feature the cage will no longer be sanctioned by the Shooto organization. An affiliation with the new AFL group will give the IHC the same legitimacy that was afforded by Shooto. While nothing has yet been set in stone, the relationship appears to be inevitable. More information will be released as it unfolds.